1990-91 Pro Set Hockey Series One consisted of 405 cards. Included were cards of Owen Nolan and Petr Nedved, the first overall and second overall picks in the 1990 NHL Entry Draft. However, Pro Set missed out by NOT including fifth overall pick Jaromir Jagr or 20th pick Martin Brodeur. So I decided to make custom “Draft Picks” cards of these two players. 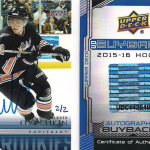 Other companies, such as Upper Deck and Score, included cards of Jaromir Jagr from draft day. 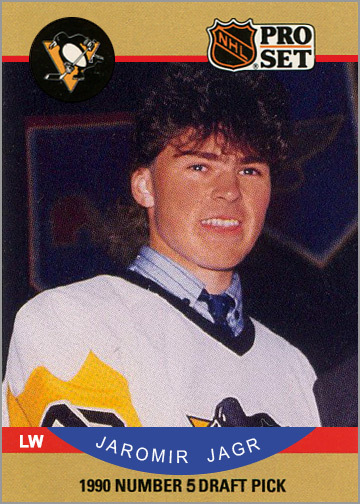 The photo used above is actually taken from Jagr’s Upper Deck rookie card. 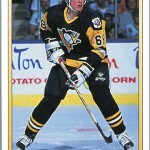 Pro Set put out a card of Jagr, playing with the Penguins, in Pro Set Series Two later that year. 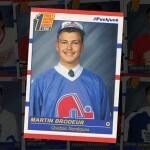 Martin Brodeur, on the other hand, never had a Pro Set card. 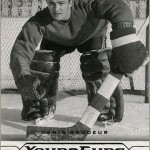 Other than a five game call-up in 1991-92, Brodeur spent 1990 to 1993 either with his junior team or in the minors. 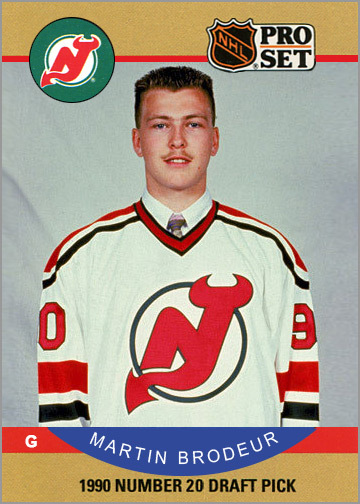 For this custom card, I found this photo, which was taken soon after the New Jersey Devils selected Brodeur 20th overall. Seeing as how utterly comprehensive Pro Set tried to be, I am surprised that they did not issue “draft day” cards of all 21 first round draft picks. That would have made for a nice snapshot of one of the deepest drafts in NHL history. Question: Looking back 23 years later, who should have been the first overall pick in the 1990 draft: Jaromir Jagr or Martin Brodeur? 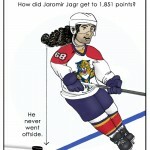 I’d go with Jagr. I’m not so sure Brodeur would have had the same kind of success had he been drafted by another team. Looking back at Brodeur’s career, especially in the playoffs since I think it is going to be tough for New Jersey to make it back to postseason with no real star scorers on their team, Brodeur had the best chances of his career to win a Stanley Cup or at least go deeper into the playoffs and he often choked. Just look at the 2001 Final. Game 6: he allows 4 goals and the Devils get shut out at home before losing 3-1 in Game 7 in Denver. 2002: they lose to the Hurricanes in the first round. I mean I know the Hurricanes somehow were a hot team in ’02, but New Jersey should have been able to beat them. 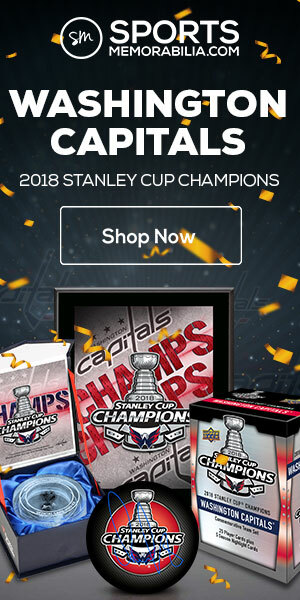 2003 they win the Stanley Cup in a series that probably shouldn’t have gone to Game 7, especially looking at that goal that went off Brodeur’s stick and went five hole on a real flukey play. Each win was a home win, but the Devils were a much stronger team then and probably should have won in five or six games. 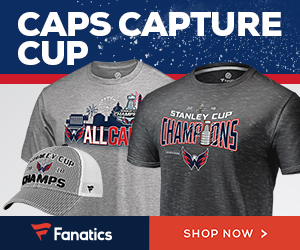 He did win the 2000 and 2003 Stanley Cups, but they were the favorites in both series. 1995, yeah they swept the Red Wings on home ice in Jersey. Goalies can make or break a team at times, and it seemed like as far as winning the Stanley Cup goes, Brodeur didn’t make the Devils teams that won three Cups. Jagr has 600-plus goals and over one thousand assists in his regular season career, and he might have been one of the pieces that got the Penguins over the bar in ’91 and ’92. Lemieux was injured for much of the 1990-91 season, I think, even though he played through it in the playoffs. Anyway, I’m not a Brodeur fan for a lot of reasons, but mainly because he chokes at critical times in the playoffs year after year and I think that people who say he is the greatest goalie ever fail to see that he doesn’t do real well under pressure. Brodeur was best pick , jersey don’t win those cups without him , Jagr played a minor role in Pittsburgh’s 2 ’90 cups.